With latest election results, at least 104 of 138 elected and appointed officials accused of sexual misconduct will be out of office, new Georgetown Law research finds. WASHINGTON (Nov. 9, 2018) – In the most comprehensive accounting of its kind to date, new Georgetown Law research finds that 138 elected and appointed officials were accused of sexual misconduct in the last election cycle. After this week’s election, at least 104, or 75 percent of them, will be out of office by January 2019. 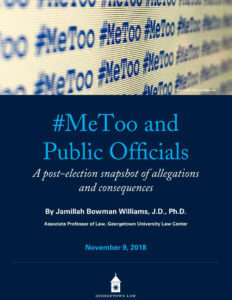 The research, led by Georgetown Law Professor Jamillah Bowman Williams, found public reporting that 111 elected officials and 27 other officials from 45 states were accused of sexual harassment, sexual assault, other sexual misconduct, and violence against women since the 2016 election. All but three of the accused were men. Allegations against 18 of the officials were reported over a 10-month period before the #MeToo movement took off. Accusations against the remaining 120 officials surfaced since October 2017, when allegations against Harvey Weinstein made news and the #MeToo hashtag exploded on social media. The accused included 14 members of the U.S. Congress, 84 state legislators, 13 other elected officials, 25 appointed officials and two former government officials running for office. Leading up to Tuesday’s election, the majority of the 138 accused officials had already left or been ousted from office. A total of 77 stepped aside, including officials who resigned, retired, decided not to seek reelection and two who committed suicide. Another nine officials were removed from office, and 15 lost their primary elections. This past Tuesday, 27 of the accused officials ran for reelection, and 23 won their races. One race is still undetermined, pending a recount, and three officials were voted out. Two of these men lost their election to women candidates. Despite the electoral wins this week, overall, 75 percent of the accused officials are or will be out of office by January, and another eight officials have yet to face reelection. Beyond losing political positions, a number of officials also face legal action, including seven civil lawsuits and 12 criminal charges. Download the full report: #MeToo and Public Officials: A post-election snapshot of allegations and consequences.